While the 1963 Studebaker Wagonaire was innovative in many ways, it was sadly not enough to save the company from ruin. Studebaker lumbered along for another three years, but ultimately succumbed to poor sales. The Wagonaire, a version of the Lark wagon, had been the brainchild of noted industrial designer Brooks Stevens, acting on the directive of the company’s president, who thought it needed an expanded lineup but lacked the capital to make heavy investments. 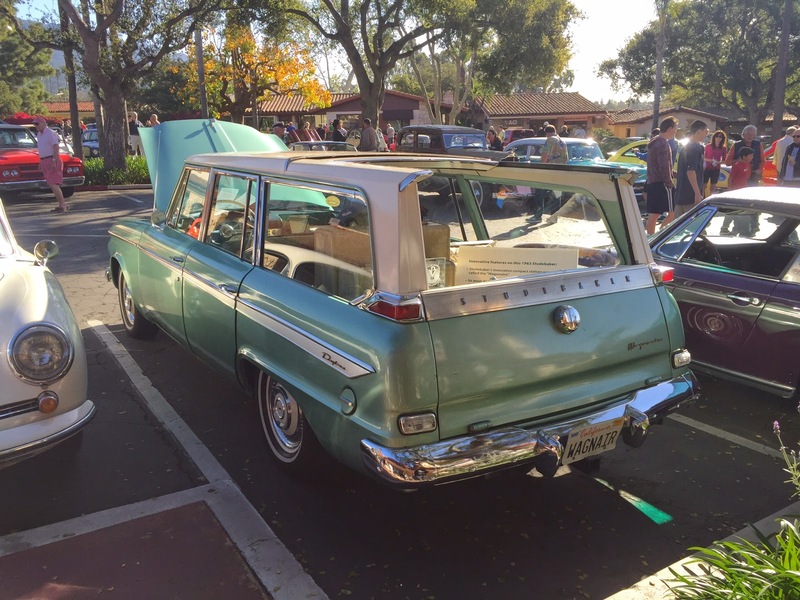 The Wagonaire introduced a sliding rear roof panel to the Lark, which would glide forward, opening the cargo area for taller items, like house- hold appliances. A wagon-loving fam- ily could use it for occasional pick- up-truck duty, without the sacrifices that, especially at that time, a truck would entail. The innovations on the car were so advanced that they would inspire even vehicles in the modern era. The 2004 GMC Envoy XUV featured the same type of sliding panel, and Ford introduced a tailgate step very similar to the Wagonaire’s on the 2009 F-150. Despite their relative rarity, David Neel was able to find his on Craigslist a few years ago. 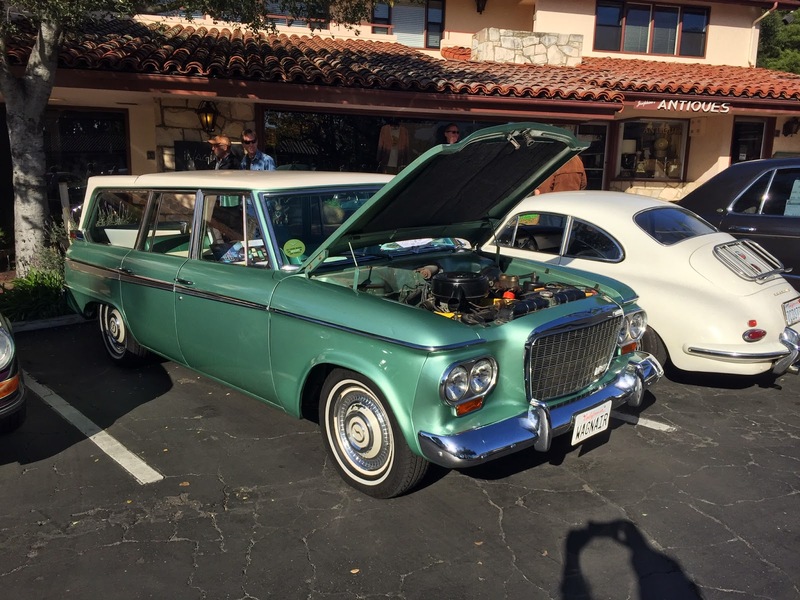 He brought it to Cars and Coffee, in the Upper Village in Montecito, on March 8. Neel gave me a little tour of some of the car’s other interesting features. The headliner appears to be vinyl, but it’s actually cardboard, which offers an easy way for prospective buyers to assess the conditions in which it was stored. 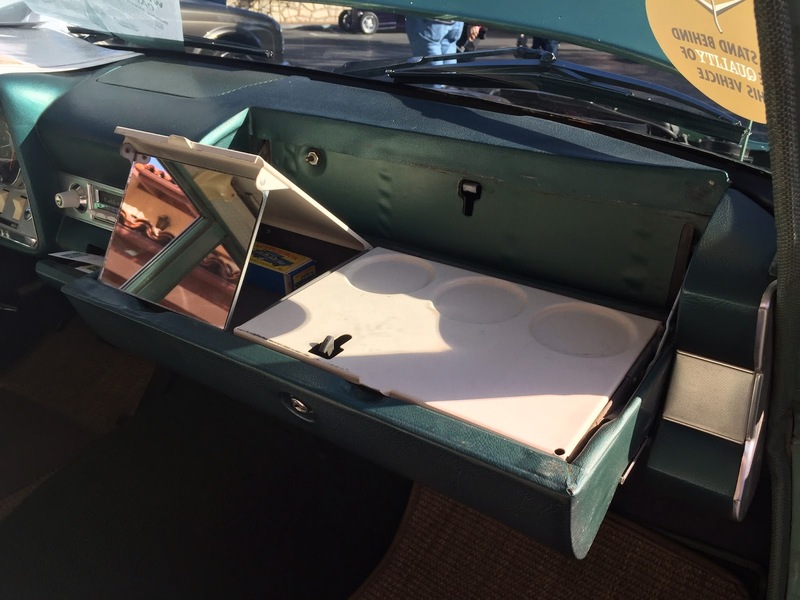 And where you might expect to find the glove box is a compartment labeled “Vanity”, which houses a make-up prep surface, complete with a mirror. This delightfully quirky car was Neel’s first Studebaker, but not his last, and it’s certainly not his only car with an abundance of character. When we talked that day, he rattled off a list of interesting American relics he owns, from a 1961 suicide-door Lincoln Continental convertible to a ’64 Jeep Wagoneer – incidentally, like the similarly named Wagonaire, also designed by Stevens. And Neel’s collection extends beyond just cars, to items like classic Airstream trailers and a 1947 Cushman scooter. The other Studebaker in his collection is a 1964 Avanti, a fiberglass sports coupe that has been the obsession of many enthusiasts over the years. 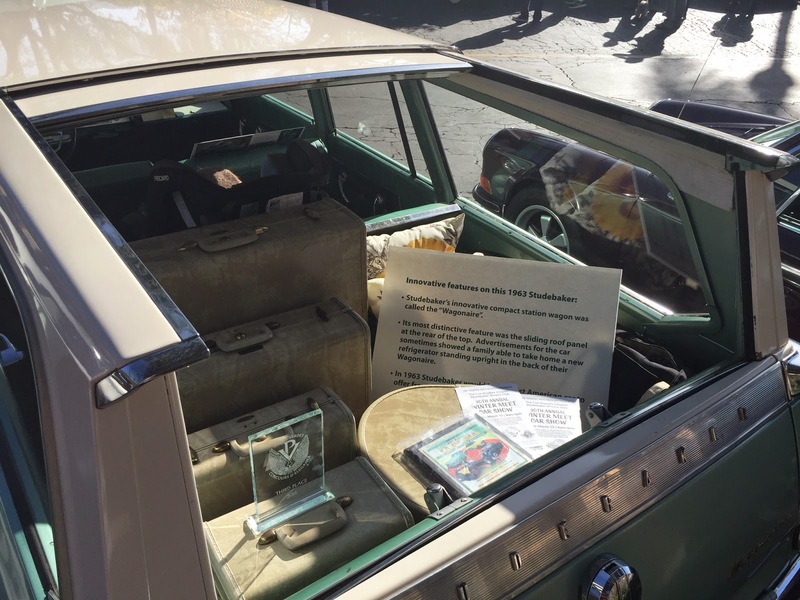 Neel might sometimes have difficulty picking one from his collection to bring to Montecito, but his decision to bring one of his Studebakers Sunday morning was certainly strategic. He was also there to promote the L.A. Studebaker Drivers Club’s 30th Annual Winter Meet Car Show, which he is hosting at the Murphy Auto Museum in Oxnard. The show runs one day only, Sunday, March 15, from 9 am to 4 pm. Admission is $10, and that gets you a look at not only the Studs, of which there will be around three dozen, but also the regular collection of the muse- um (more than 65 privately owned classics), the current exhibit featuring Jeeps all the way back to WWII, and the museum’s 1,800-square-foot model railroad. Neel doesn’t just run the Murphy Museum, he owns it. He took control early last year from Dr. Daniel Murphy, who created it originally to house his Packard collection. Since then, it has grown thanks to the several private collectors who store their cars there. The museum has a rotating exhibit that changes four times per year, and when the Jeeps leave at the end of this month they’ll be replaced by a display of vintage campers. Later in the year, the exhibits will include classic Corvettes and Mopar products. The museum isn’t a full-time gig for Neel, as it’s only open on the weekends, but it does get roughly 5,000 visitors per year. The museum relies on the generosity of donations from visitors and volunteer hours from its staff. toys happen to be excellent examples of industrial design. Aside from those vehicles designed by Stevens, his Avanti was penned by Raymond Loewy, and his Airstreams need no introduction. Even the diminutive Cushman scooter is a study in design elegance. Still, their “forward-thinking” design did little to guarantee success, as their production runs were short. The Wagonaire died with the brand in 1966, and the Avanti’s run was even shorter, with only two model years totaling fewer than 6,000 cars.